You may have noticed that articles have not been coming in as fast as they were but now I am back and ready for another year 2016! So I wish you all a good luck with this year. Now to finish the article on this Microsoft Surface Book what a great little laptop this is. The first two amazing features of this laptop are that you can remove the screen from the keyboard and turn it into a tablet / clipboard. The screen can then be used as a tablet or clipboard. The design has been really thought out well. Microsoft have designed a new type of hinge to work with this new type of laptop and they have called it the dynamic fulcrum hinge. A bit of a mouthful I know, but it works really well. When the hinge folds back it moves the weight of the screen so that the keyboard has more leverage to be able to support the screen. While its very well designed and looks cool, if I have to fault it slightly there is still some movement in the screen which you wouldn’t get from a regular laptop. However being able to remove the screen and use it like a tablet soon negates this small issue. Its designed so well that it gives the Apple products a real run for their money. Lets talk about price. At the time of release the ultimate laptop starts at $1,499.00 USD. Not a small amount. However when you compare it to the 13 inch MacBook Pro, which doesn’t have a touch screen and doesn’t detach its screen and doesn’t have a pen. You might say that $1,499.00 seems like a bargain. I will leave that choice up to you guys. If you are in the Market for the Surface Book you can buy them through the 123myIT Store. This video will show you an unboxing of the Apple MacBook Pro 13 inch Retina Display (2015) laptop. I managed to get my hands on the Apple MacBook Pro 13 inch Retina Display (2015) model. This is to try and help 123myIT users with some of the problems they face when they are trying to get Windows 8 or Windows 10 installed on Apples newest version of laptops. Shortly I will do a step by step video on how to install Windows 8 and Windows 10 on the Apple MacBook Pro 13 inch Retina Display (2015) laptop, however lets take a quick look at what you can expect when you purchase the new version of the MacBook Pro. On the outside of the laptop there isn’t much changes the design is pretty much the same as the 2014 MacBook Pro. However with the Apple MacBook Pro 13 inch Retina Display (2015) version there is the change of the Track Pad. Now I know what you are thinking. Come on Matt big deal right? Who cares about a Track Pad and what actually features can you improve on? Well after using the new MacBook Pro in the video I briefly show you what is possible able with the new track pad which has the new functionality called Force Touch. I describe it in the video as a click within a click. But its more then that. The second click seems to be pressure activated. What this allows you to do, lets say if you are browsing a website and you have a website link on the page. Clicking once and then on the second click if you use a little bit of pressure you can get a small preview of the page that is linked. On the second click if you use allot of pressure it will bring up a bigger preview of the linked page. Its a bit hard to explain without actually using it for yourself, but you get the idea anyone. On the outset it might seem like a gimmick. However some people might find this feature pretty useful. Worth the upgrade? Hard to say. If you are a Mac fan any upgrade is probably worth it. However if you do have a 2014 model you could probably run with that for now. This video will show you how to Upgrade the hard drive in your laptop. Upgrade the hard drive for the Asus G751J laptop that I purchased about a month ago. If you want to see that review you can go here. Why would you want to upgrade the hard drive on a laptop. Basically the SSD drive can great improve the loading times on any laptops. You can buy the laptop with and SSD already installed however usually I find the price of the laptop is greatly inflated because of the SSD. Yes they are expensive but not that expensive and some company’s seem to think they can charge extraordinary prices for the privilege of an SSD drive pre installed into your laptop. So to combat this I always select a model that has a SATA drive which is much cheaper than an SSD and I upgrade the hard drive myself. This also allows me to choose the size brand and model of the SSD, which I think is also very important. In this video I choose the Samsung SSD 850 EVO which has a capacity of 500GB. This SSD drive sports the following features. See the link above for more info on the Samsung Solid State Drive 850 EVO. In the rest of the video I show you how to remove the current primary SATA drive and install the faster SSD, by opening the bottom of the laptop and unscrewing the primary drive and move it to the second bay of the laptop. Now not all laptops have space for two hard drive bays. So in some case you can buy a caddy that will fit into your DVD slot on your laptop allowing you to be able to have two hard drives which is pretty neat. This video will show you the Asus G751JT-CH71 Unboxing & Benchmark. I am pretty excited as I sit down to write out this 123myIT update. The video above was the first video I have recorded in 4K resolution. It marks a new era for 123myIT and a higher video quality for 123myIT users. Now that that’s over with, let start talking about the Asus G751JT-CH71 Unboxing. I have been a fanboy of the Asus Republic of Gamers laptops for the past 4 years. As much as I hate to say the word, its probably true. In this time I have owned the following models. Click the links above for previous reviews. Why do I upgrade to a new laptop every year I here you ask? Well I use the laptop for gaming and for work on the 123myIT.com website. So I like to keep the technology up to date. So after one year I buy the newest laptop and I sell the old one on websites like Gumtree.com. This allows me to keep up to date with the latest hardware without costing an arm or leg. I also never buy the very top of the line hardware as I don’t see it as value for money. And while you might think this laptop is the top of the range, its actually not and I will explain why. This model comes with the Geforce GTX 970m and not the Geforce GTX 980m which is the faster GPU. This model also doesn’t include the faster SSD drive rather it has the slower 1TB 7200 RPM Sata drive. Which I will actually do a video on how to upgrade hard drive later. So as you can see, I have gone purely for bang for my buck type of laptop. What I like about the Asus laptops is that they are powerful with nice design don’t have ugly flashing lights on them, they run at a cool temperature due to the massive big fan cooling system on the back of the laptops. 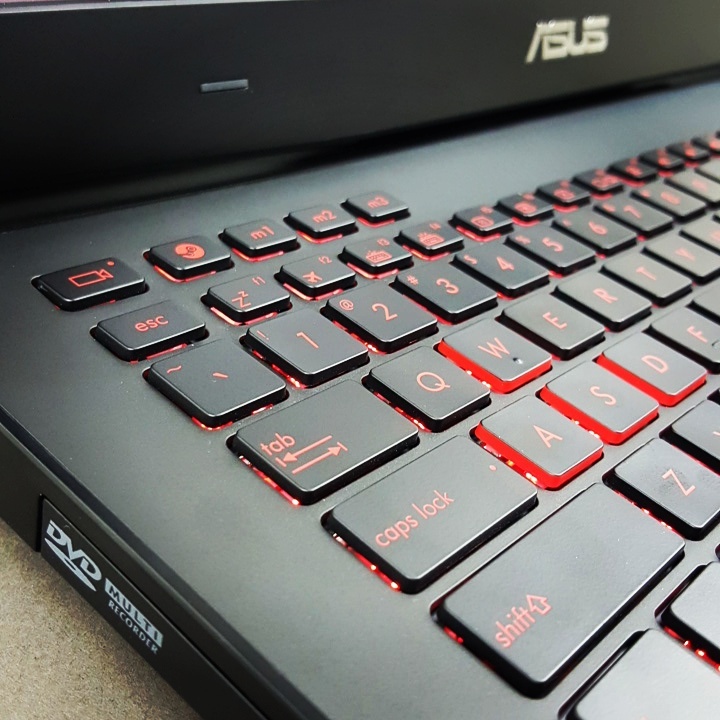 So on first look at the latest Asus G751JT-CH71 model, the first things I noticed is that the grills at the back of the laptop have been panted red. I am not sure If I like this colour change I see it a kind of “try hard”. But maybe that’s just my taste and others will probably disagree with me. The next thing you will notice is the keyboard has changed from white background keys to red, and the keyboard now includes a few extra keys such as the ROG key, Shadow Play, Stream and Macro keys. Also the WASD keys have been highlighted with a awesome red colour which make hem stand out. The only draw back here I seem to press Shadow Play key by mistake rather then the Escape key which I find very annoying as it boot me out of any game I might be playing and back to the desktop. The other upgrades are the newer 17.3″ 16:9 IPS FHD (1920×1080) anti-glare display which makes the colours look deeper as well as a CPU upgrade. Asus has tied it all together very nicely with a well designed chassis. While this laptop wont be for everyone, if you are looking for a desktop replacement gaming laptop then you should definitely take a look at the Asus G751JT-CH71.